Learn modern and attractive options for updating builder-grade switches and outlets like screwless wall plates, built-in nightlights, and USB chargers. In the past seven years since we bought this house, we’ve made many changes. Some were very obvious, like new hardwoods throughout the first floor. 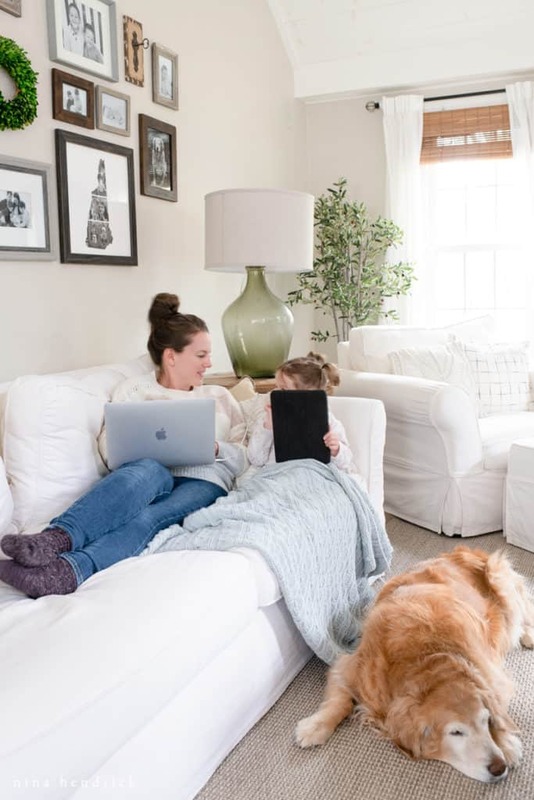 Other changes have been a bit more subtle, but they all add up to the overall feeling of a completely renovated modern home that functions well for our family. Today I’m going to talk about one of those subtle touches that makes a big difference: updated light switches and outlets. Along with the other dated finishes, when we bought the house it still had the original almond-colored builder switches and outlets from the 1980s. They were chipped and had cover plates that had been sponge painted to match the walls. This post is sponsored by the radiant collection by Legrand. However, all opinions are my own. I only accept sponsors for products that I believe in. Please see my disclosures for more details. 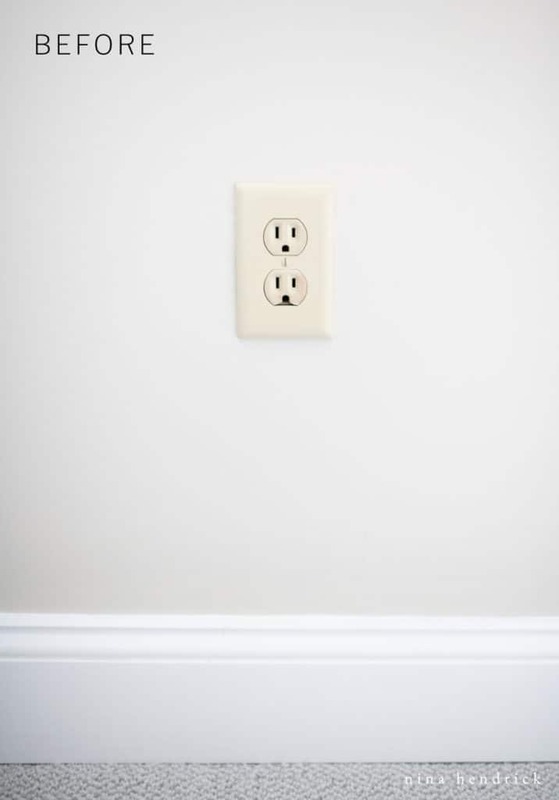 Additionally, please consider hiring a licensed electrician to help you with installing switches and outlets, as electricity can be dangerous. Between the mid-1980s and today, outlets, switches, and cover plates have definitely come a long way. When Legrand reached out and asked me to share their radiant collection, I knew that this was something that I could discuss that has made a big impact in our home. New decorator style outlets and switches have been part of every project and on The List since we started sharing our renovation! While the technology and functionality of outlets and switches have certainly evolved (and I’ll definitely be talking more about that in a minute!) over the years, the aesthetics were the original guiding factor in replacing these items in our renovation. After all, we wouldn’t want to leave the dingy almond outlets and switches in a newly updated room! 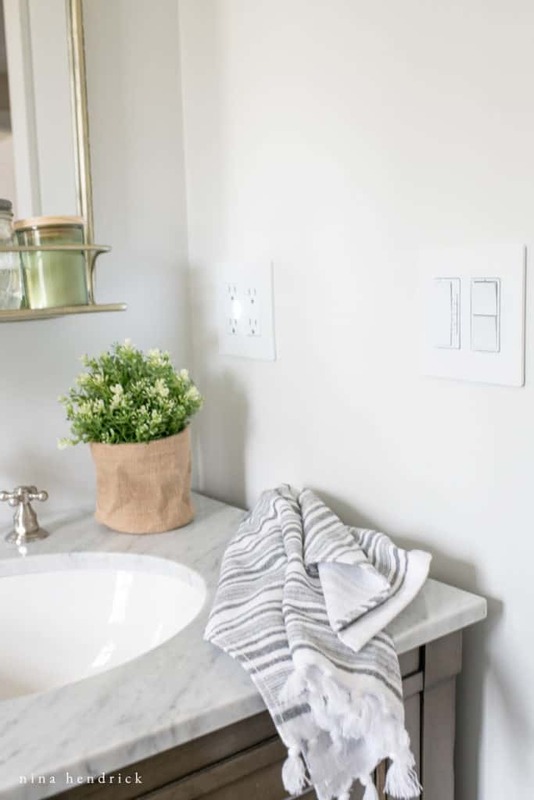 Not only are the outlets and switches in the radiant collection sleeker in design than what we started with, but they also have smooth and screwless wall plates. Overall, this is a modern and elegant look that allows the plates to work more naturally with the design of a space. For several years, our solution for a nightlight for the kids had been to leave the bathroom light on all night. Obviously, this was not the ideal solution. However, nightlights out in the hallway kept burning out and/or getting knocked out of the loose outlets by passers-by. 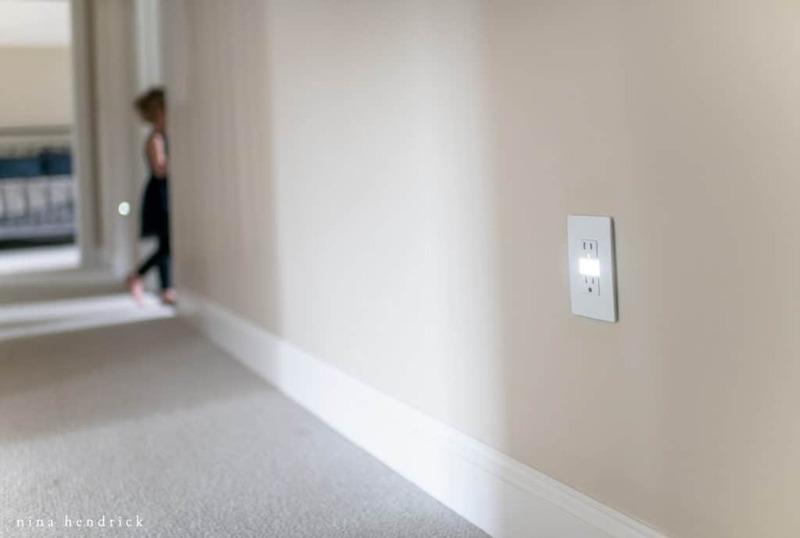 The radiant collection offered the perfect solution with tamper-resistant outlets that included a built-in nightlight. The nightlight has three brightness settings or can be turned off when not in use. Now the hallway outside the kids’ rooms is illuminated to help light the path to the bathroom or our bedroom in the dark. 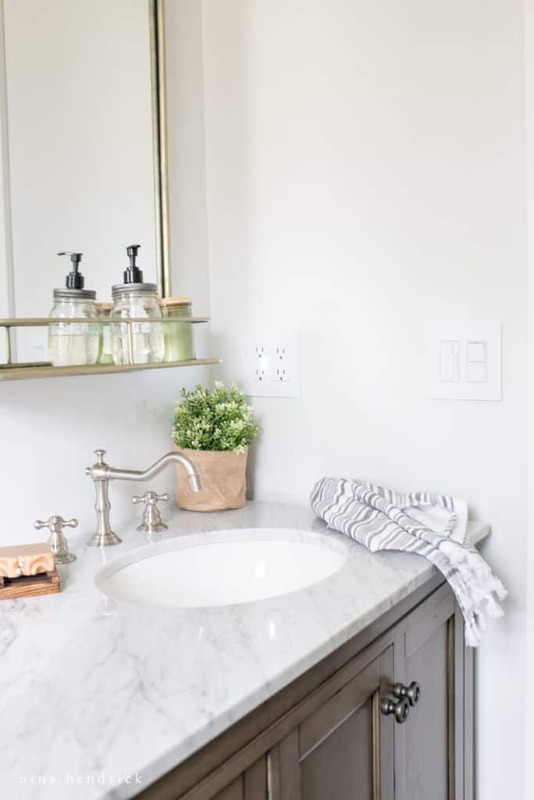 Our most recent project is our kids’ bathroom that they will share with guests (you’re actually getting a sneak peek and I’ll share the full room soon!). It’s a smaller room. However, it has several things going on. There’s an overhead light, vanity lights, and an exhaust fan. We also wanted to make sure there were enough outlets for their electric toothbrushes. Also, another nightlight. Not to mention the hair tools that Lyla will probably want to use in the future. Yes, a lot of electrical needs. Our first solution was to use a Two Single Pole Switch for the overhead and vanity lights. I will admit, I didn’t even know these existed. However, it has been so helpful for consolidating! 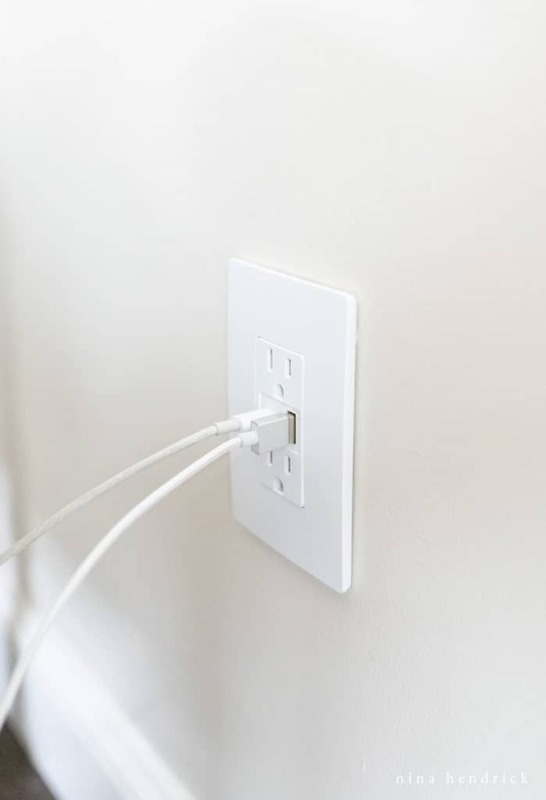 The whole wall would have been switches and outlets otherwise. We had also experienced that the kids (if they remembered to use it at all) would leave the exhaust fan on indefinitely. This 4-Button Digital Timer shuts off automatically after the designated amount of time has passed. Another cool feature is that it automatically defaults to the previous time you used, so we can set it to twenty minutes once and the kids just need to tap the switch once without trying to figure it out themselves. In the quad, we used a GFCI Outlet w/ Nightlight Component. 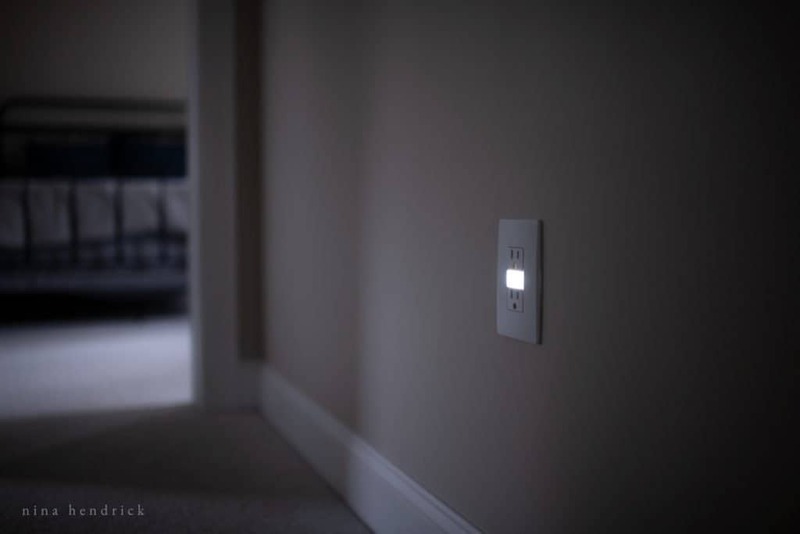 The nightlight turns on automatically in low light, which is extremely convenient. I don’t know about you, but we have a mystery in our home. It’s the case of the disappearing charger cubes. As a result, they’ve become a hot commodity. We’re possessive of those small and easily misplaced hunks of plastic. Brother battles have been fought over them. I have a special horde of my own (and sometimes I buy them in pink to discourage theft). Our final new outlet is definitely the biggest thwart to this epidemic of missing cubes, and something we’ll surely be adding to other rooms. It’s a Hybrid Type A/C USB-C outlet, which is a fancy way of saying that it’s a combination of a USB outlet and USB-C (a.k.a Thunderbolt MacBook cable). So, I’m able to charge my phone and laptop with just the simple cables rather than hunting down cubes and toting around the clunky computer charger. 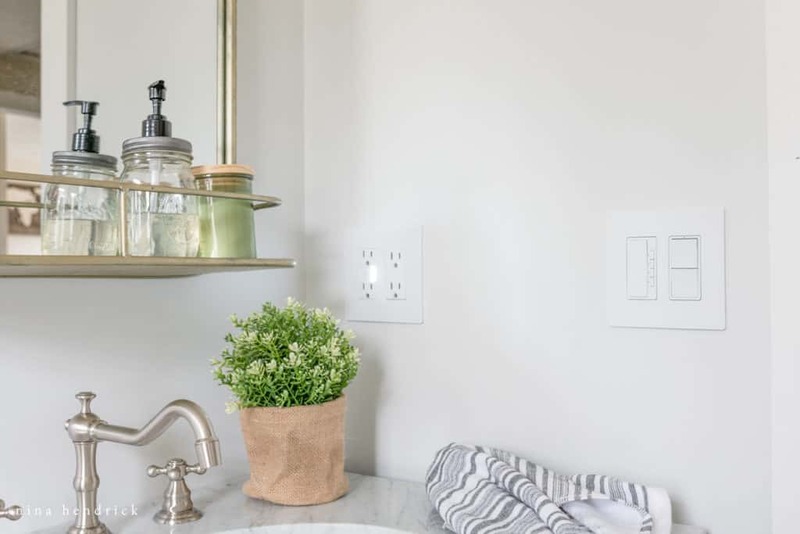 Although it may seem like a small detail, these switches, outlets, and wall plates all moved us closer to our goals of a more modern, attractive, and functional home for our family. They met our needs for aesthetics and solving problems like nightlights, timers, and chargers for electronics. You can also visit my Instagram to see a video of how the nightlights work! Comment below and let me know, have you updated your builder-grade switches and outlets? Or is it still on your to-do list?